Method: Crack 3 eggs into a small mixing bowl and beat with a fork until well mixed. While mixing eggs, start preheating an oven to 350 degrees. Next, place a nonstick skillet over medium high heat and once warm add olive oil. Start by sautéing the mushrooms in the oil until you start to see them soften and brown slightly. About 2 minutes. Add the spinach and sauté until it just beings to wilt. Season veggies with salt and pepper. Now add the 3 eggs and stir just enough to incorporate spinach and mushrooms evenly throughout the egg mix. Next sprinkle 1/2 the goat cheese on top of the cooking egg mix and place it in the preheated oven. Cook for about 8-10 minutes or until the eggs are set and have fluffed up some. 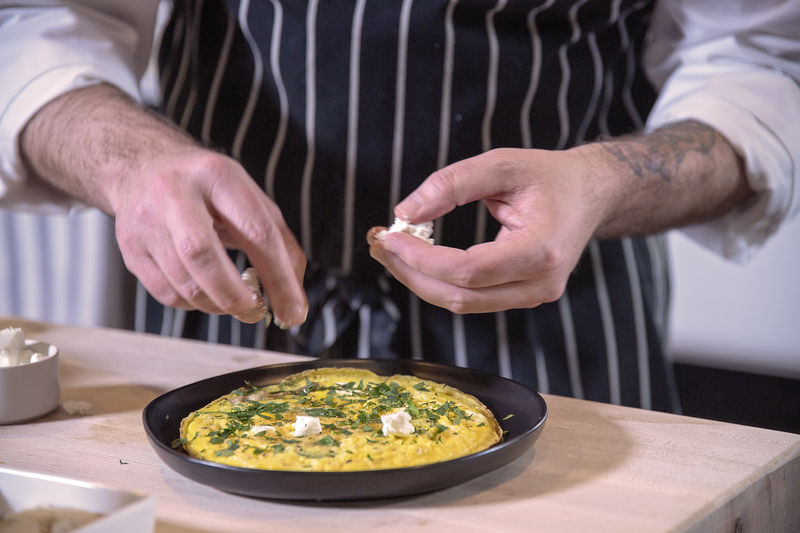 Remove skillet from oven and slide frittata onto a plate or serving platter. Add remaining goat cheese, season top with a little more salt and paper, and any fresh herbs that you enjoy.